My friend, Rob, of the Curious Blogquat, introduced me to egullet. It’s a website home to many food related forums. 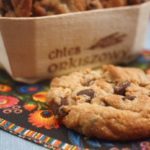 I noticed that Alton Brown’s chewy chocolate chip cookie was the recipe many on egullet were using. I gave it a try last night and loved it. The only other recipe that has given me such good results takes a lot more time and hasn’t always produced consistently. Except for the sampling done last night, these are going in the freezer. My daughter is going to Berlin soon, and I thought I’d slip these in her suitcase for her and Zach, her college friend and host in Germany. Zach was kind enough to put my husband and me up and show us around town when we visited Berlin last year. Considering we had not met him before this, it was especially gracious. I’ll have to make them again soon. After all, the rest of the family deserves the perfect chocolate chip cookie too. These, my friends, are cookies you can be proud of. PS – I happily introduced Polish friends to this, the best of American cuisine. Preheat oven to 375 (190C). Sift together the flour and baking soda, add the salt and set the dry ingredients aside. Pour the melted butter into the mixer’s bowl. Add sugars and cream on medium speed. Add egg, yolk, milk and vanilla. Mix until well combined. Scoop (with ice cream scoop) onto parchment lined baking sheets, 6 cookies per pan. Bake for 14 minutes total. Rotating the pan after 5 minutes. *Bread flour has a higher gluten content than all-purpose flour; it produces a chewier baked good. If you can’t find it, you can substitute all-purpose flour. ** Can’t find chocolate chips? Chop up a couple of chocolate bars. I’ve added the metric measurements for my Polish friends Gosha and Remy, who would both like to add this American classic to their baking repertoire. Im polish, live in italy and used ur recipe. 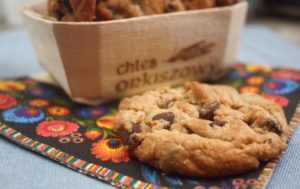 Thanks, cookies are fantastic, recipe works well in eur mes. I got 24 huge cookies. I’m glad it worked for you, Kinga. I’m happy to send a taste of the USA to Italy.